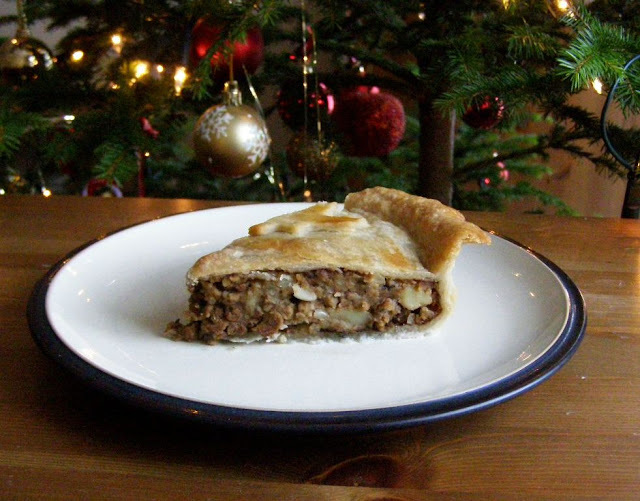 I decided to try a vegan tourtiere for Christmas dinner this year. 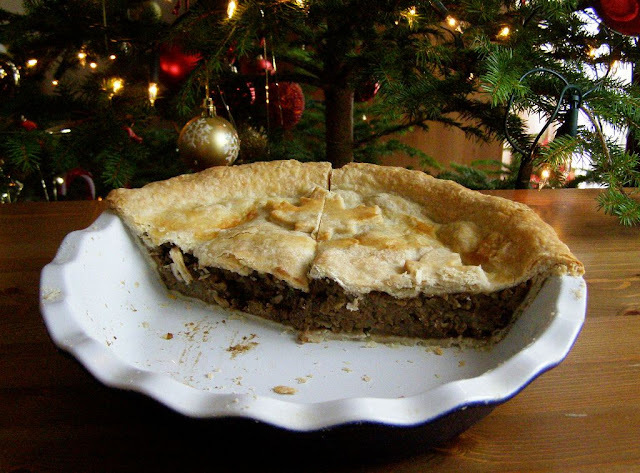 A tourtiere is a traditional French Canadian dish consisting of a double crusted meat pie seasoned with wintry spices of cinnamon and nutmeg. Although traditionally made with ground pork it's the spices that make it so it lends itself very well to soya mince. It turned out fantastic and was absolutely delicious, will definitely be doing it again next year. Makes a nice change from all those nut roasts! I never took a photo of the whole Christmas dinner but it was much the same as my earlier Thanksgiving post. As well as the tourtiere we had stuffing, mashed potatoes, roasted carrots and parsnips, brussel sprouts and petite pois in lemon hazelnut butter, red cabbage and mushroom gravy, which went very well with the tourtiere, all served with champagne. Recipe was originally on Yves Veggie Cuisine website but now gone, thankfully re-posted by someone somewhere! Ideally, use a food processor: Add the flour, salt and shortening and process until you have fine crumbs. With the mixer running add the water and vinegar. You will have a mixture that looks like moist crumbs. Gather it together into 2 balls, one slightly larger than the other and press down into a disc onto a sheets of cling film, wrap up and chill for 30 minutes. Alternatively: Mix flour and salt, cut in shortening with a pastry cutter until it's like breadcrumbs, sprinkle water and vinegar on and stir with a fork until a ball forms. Gather it together into 2 balls, one slightly larger than the other and press down into a disc onto a sheets of cling film, wrap up and chill for 30 minutes. Roll the larger piece out to line a 9 inch pie plate, leave sections over hanging. First peel the potato, cut into quarters and cook in slightly salted water for 20 minutes or until tender, let cool then roughly mash with a fork, you still want some chunks. cover and set aside. You can do this earlier in the day. Heat the oil in a large pot and fry the onion with some ground black pepper until the onions are soft. Add the garlic, stir then add the spices, potato, mince or lentils and water. Cook till water is gone and it's all heated up nicely. Pour and scrape into the lined dish. Roll out the other piece of dough, brush water along the edges of dough lines pie dish and place dough on top. Seal edges then cut off all excess dough along the edges. I rolled these out and cut out maple leaf shapes to decorate the top of the pie. It looked great, shame I never took a photo when it was whole. Brush whole top with unsweetened soya milk and bake in 220C degree oven for about 20 minutes or until nice and golden brown. Let sit 5 minutes then slice and serve. Melt the butter in a small saucepan and fry the onion until dark golden brown. Add the mushrooms and cook for a further 2 minutes. Stir in the flour, cook gently for 1 minute and then gradually add the stock. Bring to the boil, stirring constantly, until thickened and blended. Add more water if too thick. Woo that's amazing! 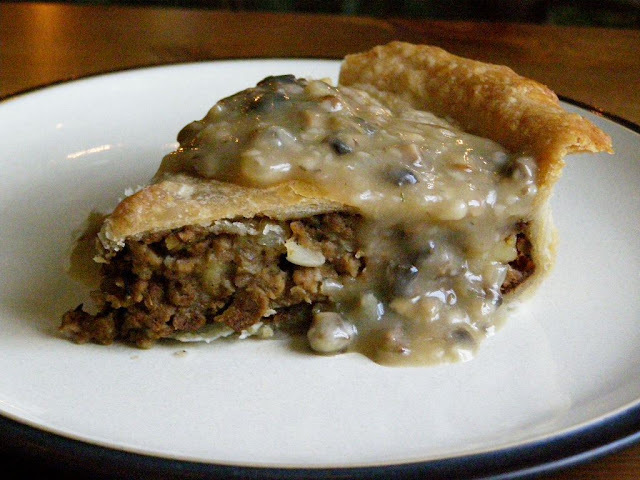 I love Canada and have heard of tourtiere before. It would be amazing to see more traditional Canadian recipes in the future. Thanks for sharing!